This tutorial leads you through various LD and haplotype analyses in SVS 8. 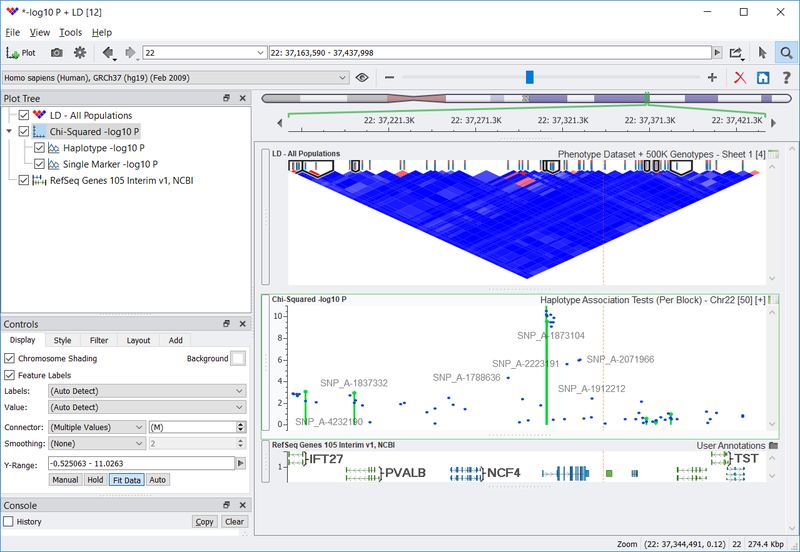 For demonstration purposes, a simulated dataset is used consisting of actual Affymetrix 500K genotypes from the four HapMap populations (Phase II) mapped to the hg19 Human reference build GRCh_37, a simulated case/control status, and a simulated quantitative phenotype. This tutorial does not cover quality assurance, and therefore no quality assurance steps have been performed on the data in this tutorial. As it may be appropriate to filter markers based on Hardy-Weinberg Equilibrium or filter out markers with low call rates and minor allele frequencies, it is recommended that you perform such measures with your own data prior to performing LD and haplotype analysis. We hope you enjoy the experience and look forward to your feedback.